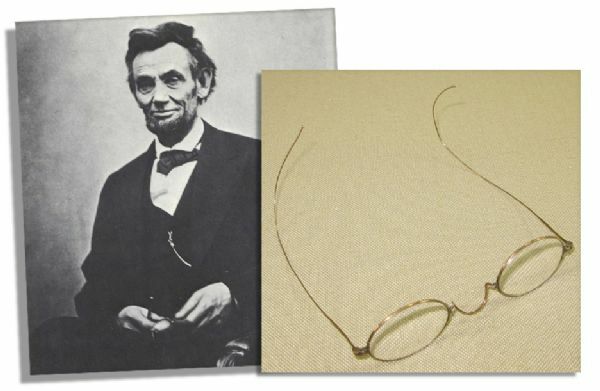 Spectacles worn by Abraham Lincoln, photographed with the President in the portrait taken by Alexander Gardner in Washington, D.C. in 1865 (O-116D in ''Lincoln in Photographs''). With provenance from Abraham Lincoln's great grandson, Robert Todd Lincoln Beckwith. As his last direct descendant, Beckwith writes in an ''Affidavit and Deed of Gift'', signed and dated 16 August 1977 (a photocopy of which is included in the lot): ''I, Robert Todd Lincoln Beckwith of Washington, D.C., certify that among the contents of a trunk located and unopened until recently, and placed in the attic of Hildene, the estate of my grandfather Robert Todd Lincoln, Manchester, Vermont, by my grandmother Mary Harlan Lincoln (Mrs. Robert Todd Lincoln), and the said contents being awarded to me by the Estate of my sister Mary Lincoln Beckwith, were found two pair of eye glasses which had belonged to my great grandfather President Abraham Lincoln, and so marked by my grandmother Mary Harlan Lincoln. 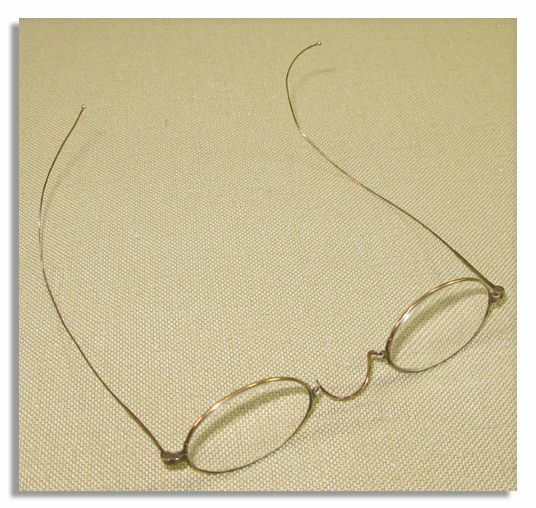 I further give one pair of these eye glasses to Margaret Fristoe of Chevy Chase, Maryland, and one pair to James T. Hickey of Elkhart, Illinois.'' Hickey was the Curator of the Lincoln Collection of the Illinois State Historical Library, now the Abraham Lincoln Presidential Library. The pair given to Hickey is still in the Library's collection. Two years after gifting the glasses to Fristoe, Beckwith married her and upon her death the glasses were passed to her daughter from a prior relationship, Lenora Fristoe Hoverson. Her affidavit is also included. 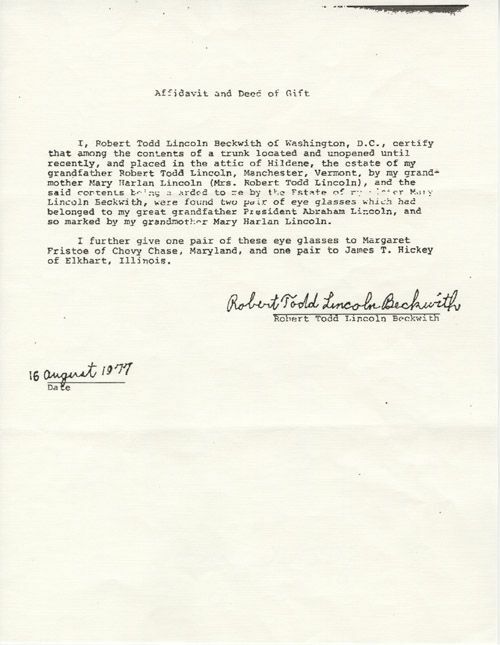 Also included is a signed letter from a board-certified optician attesting to the prescription of the glasses as +2.12, a match to Lincoln's known prescription strength in the 2.00 range. 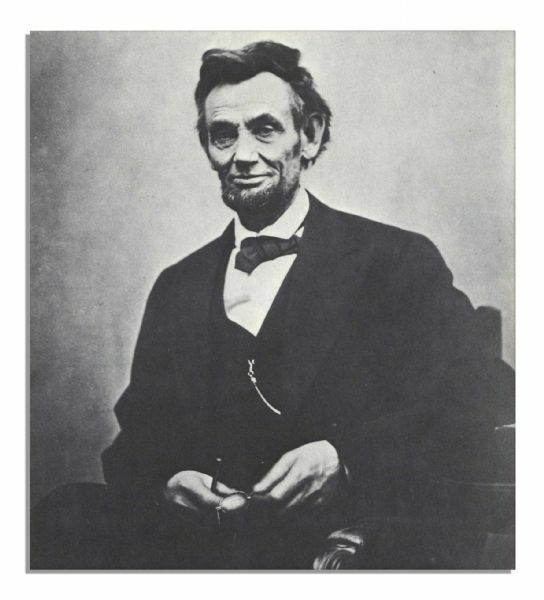 An amazing piece of personal history from one of America's greatest presidents. Auction closed on Thursday, June 27, 2013.